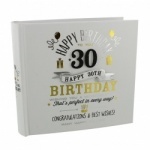 Everyone, to put it bluntly, loves a birthday – and one of the most integral components of a birthday celebration is the offering of gifts to the person whose birthday it is. After all, what fun would a birthday be were it not for this tradition? 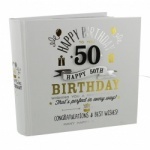 But not all birthdays are created equally; while any birthday is a special occasion, there are some which are a just little bit more significant. 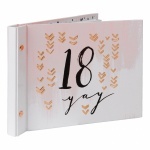 Most teenagers look forward to their eighteenth, just as most fifty-somethings anticipate their sixtieth with a mixture of dread and good-humoured resignation. Whatever the number might be, we stock items to commemorate it – all the way up to the round century we all aspire to live to. 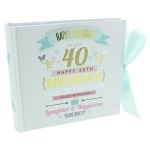 We stock wish jars, guest books, photo frames and photo albums, all bearing significant numbers on the front. 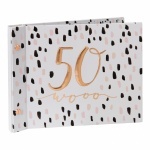 Specifically, we’re talking about the 18th, 21st, 25th, 30th, 40th, 50th, 60th and 70th birthdays. 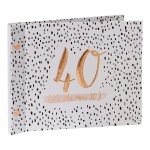 If you’re looking for something special to commemorate an especially major birthday on the horizon, then we’re sure you’ll find something to fit among the items listed here. 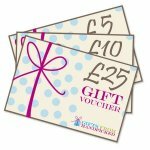 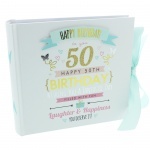 But if you can’t, then don’t despair – we also sell gift vouchers which will allow the birthday boy or girl to choose something to their liking.